We have supplied many schools across the UK since 1996 with our products, we have No minimum order on our items and accept all school and local authority purchase orders. 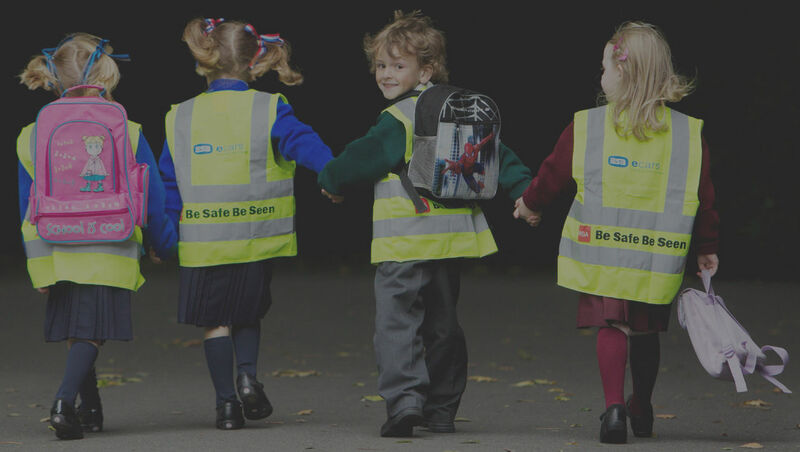 We have supplied many Schools & Education outlets with their Hi Vis Vests and clothing, could we please send you a 100% No obligation Sample featuring your details. Either WITH or WITHOUT a photo, many schools provide ID badges visibly worn by unfamiliar people on the premises, these ID badges can be colour coded and worn with a different coloured lanyard to easily identify the people to both pupils and staff. 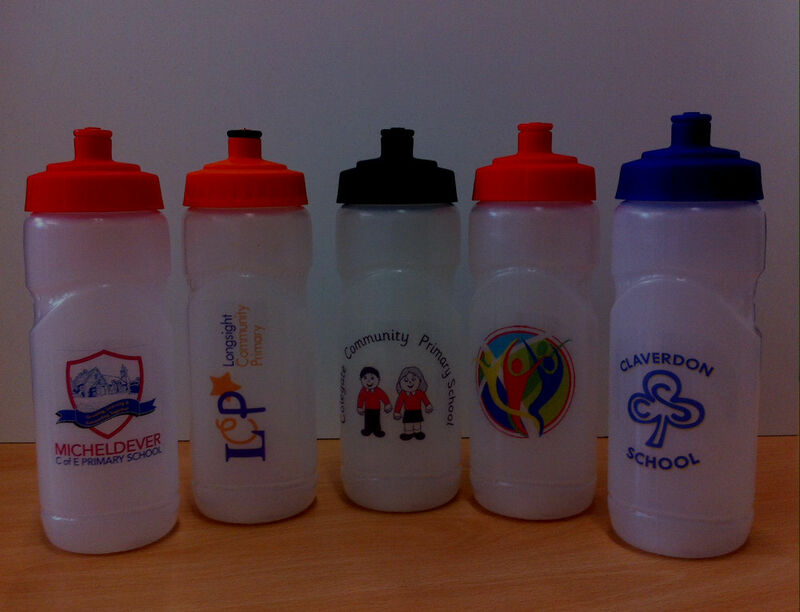 We supply over 3000 schools across the UK with their personalised water bottles. Could we please send you a 100% No obligation sample bottle with your school details? Each Visitor Book contains either 250 or 500 perforated slips to service 250 or 500 visitor. We can personalise the front cover of your visitor book with your logo, name, address and contact details. We can supply football & other sports kits from high end manufacturers also, we have direct accounts with Mitre, Prostar & Stanno, the Leading kit suppliers. We can supply all training kits, waterproof clothing and training bibs. Your colours, your words, your logo, your choice. Many schools use their 'strap line or motto' and/or the school name. Could we please send you a No obligation visual of how your lanyard would look, featuring your colours and the wording of your choice. 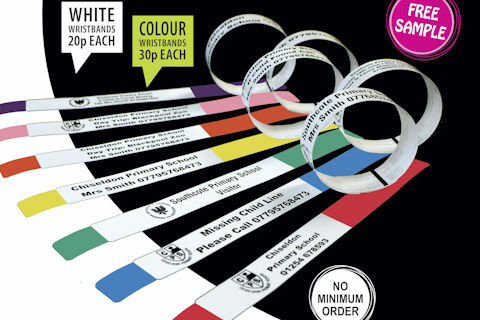 School wristbands are an essential part of a school trip, in the instance of a child becoming separated from the school group a wristband can feature contact information for the responsible staff on the trip. 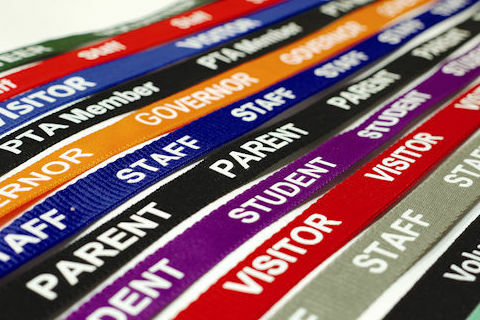 Either WITH or WITHOUT a photo, many schools provide ID badges visibly worn by unfamiliar people on the premises, these ID badges can be colour coded and worn with a different coloured lanyard to easily identify the people to both pupils and staff, we can provide a no cost no obligation sample of ANY of the above mentioned ID badges for the school. 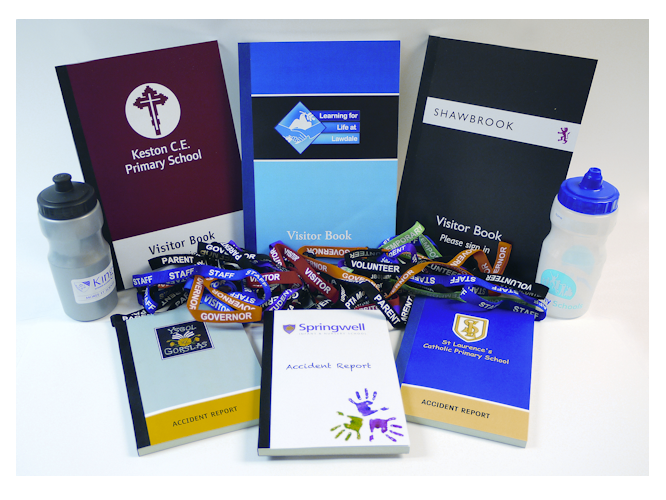 We have supplied schools since 1996, we have a small product range and specialise is supplying bespoke printed items to schools. We pride ourselves in a friendly honest service, we accept all school and local authority purchase order numbers and have a no minimum order policy throughout our range. All of our work is completed in house, we have commercial embroidery machines allowing us to complete either the most simple, or the most complicated badges, logos and emblems. 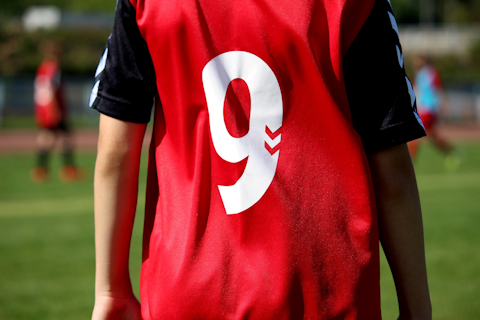 We print via a heat press method also offering either a 1 colour vinyl print in ANY colour, similar to football kit numbering, or full colour printing via our latest machine allowing us to print pictures, full colour logos/badges heat pressed onto any garment. Copyright © Ultimate Identity Ltd 2019. All Rights Reserved. Unit 42/43, Momentum Business Park, Nook Lane, Bamber Bridge, Preston, PR5 6BD.